Defence Turkey: Dear Mr. Hüseyin Avşar, first of all we would like to thank you for your time. You have been assigned as the Head of the Helicopters Department. What type of a structure will you adopt throughout this new era that started upon your assignment? What are your comments on the existing personnel structure and responsibilities as well as the vision that you plan to set for this upcoming period? I was previously assigned as a project manager at the Helicopters Department where extremely crucial projects for our country are being conducted. Currently there are two project directorates within our department consisting of the Helicopter Development Projects Group and the Helicopter Joint Production/Development Projects Group. I can state that the staff numbers in both of these groups are below the desired level when taking into consideration the number as well as the scope of the projects we have been executing. Thus, the reinforcement of our human resources will be amongst our priority objectives for the upcoming period. We are carrying out 27 projects as of today. All the Service Commands under the auspices of the Turkish Armed Forces, Gendarmerie General Command, Security General Directorate and numerous other public institutions are amongst the users to whom we are providing services. This fact puts huge responsibilities on us while offering prominent opportunities towards the development of the sector. Within this context, through the projects we have been conducting, we will be striving to fulfill the requirements of our users in an effective and efficient manner while contributing to the development of our country’s helicopter industry and increasing the capabilities of our local industry. Defence Turkey: Mr. Avşar, the Turkish Utility Helicopter Program was dispatched to Turkey to be utilized in the test and development program in the last couple of months and the activities for this helicopter were launched at Aselsan’s facilities. What would you like to say regarding the activities to be conducted over this prototype within this context and what are your comments on the integration, test activities and project schedule? As you know, as part of the Turkish Utility Helicopter Project (TUHP) for the first time the cockpit design will be developed by a Turkish company for a leading helicopter manufacturer. These Black Hawk helicopters to which this Aselsan design cockpit will be integrated will be marketed and exported worldwide apart from United States. I would like to underline that this is a great achievement on behalf of Turkey. As you also mentioned, in March we witnessed the arrival of the S70i helicopters that will be transformed into the T70 Basic Helicopter Configuration at the Aselsan facilities. The disassembly of the avionic equipment of the helicopter was accomplished and the activities are on their course as planned. We are expected to accomplish the maiden flight of these helicopters with integrated Aselsan avionics within March 2018. The cockpit integration can be considered as the first step of the transformation of the S70i helicopter into the T70 Black Hawk. 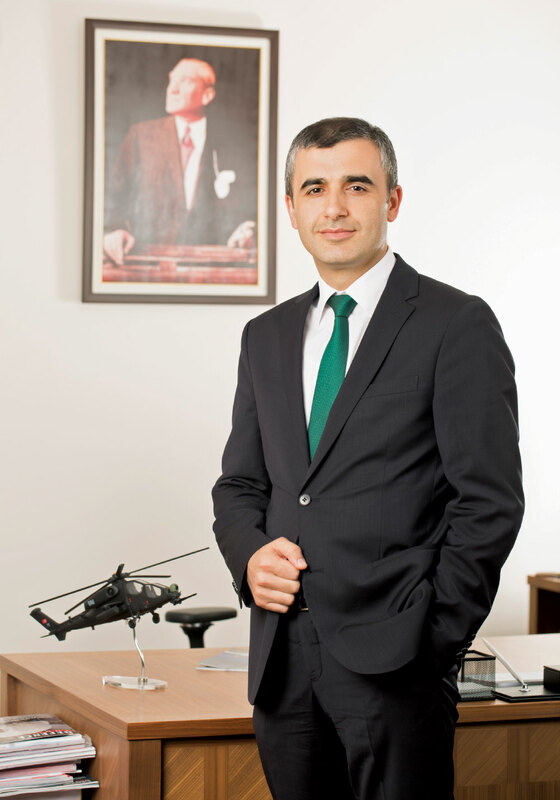 The completion of the activities regarding the Aselsan cockpit and approval of airworthiness of the prototype helicopter are planned to be finalized by September 2019. After that, a series of activities as part of the Completion Center such as the V/UHF-HF radio integration, armored pilot and co-pilot seat integration will be dispatched at the facilities of TAI. Defence Turkey: What type of cooperation is planned between both the main contractor, the sub-contractors and subsidiary industry specific to this project toward establishing an effective life cycle management process within the scope of the T70 Black Hawk program, comprising various users and different configurations? What sort of a structure is intended to be built over a project model? As part of the Turkish Utility Helicopter Project (TUHP), we will be catering to the requirements of our 6 different users for 109 Utility Helicopters in 2 main configurations. This implies that these 6 users’ deployment of these helicopters in various regions all around the country, as well as the planned/unplanned maintenance requirements and planned/unplanned spare part requirements of the users. Our activities are being conducted for the establishment of a mutual equipment repository capable of serving all TUHP fleet in various configurations, repair, coalescence of the consumable materials, and for building an Integrated Logistics Support System (ILSS) for tracking and sharing the joint requirements. In the future, the ILSS will have a flexible structure which will be able to cover the existing Black Hawk helicopters as well. We envision a model which will include numerous local sub-contractors under the guidance of TAI. We believe that this model to be established will set an example in respect to the management of the requirements of various users through a single center within the scope of the logistics support activities. We aim to finalize the related activities in the near future. Defence Turkey: How is the delivery schedule proceeding regarding the configurations for the Turkish Armed Forces as part of the T129 “Atak” Advanced Attack and Tactical Reconnaissance Helicopter program? How many helicopters have been launched into utilization operationally up until this point? Moreover, how many deliveries are planned on a yearly basis for the second quarter of 2017 and beyond? The “Atak” project is amongst the essential milestones considering the establishment of a helicopter industry infrastructure in Turkey and we all regard it as a source of pride, reaching the level we have achieved up until today. As part of the project, we have accomplished the delivery of 22 T129 “Atak” Helicopters to the Land Forces Command. We will complete either 23 or 24 helicopters by the end of the second quarter of this year and our delivery schedule is resuming at full pelt. Currently, we are striving to increase delivery from an average of a single helicopter per month to two helicopters per month. We predict that the total number of deliveries to be attained to at least 29 helicopters by the end of this year. We plan to finalize a total of 59 helicopters, bound by contract, to be delivered in 2019 by reaching our target of around 50 helicopters by the end of 2018. Defence Turkey: The Ministry of Interior Affairs plans to procure 6+3 optional T129 “Atak” Helicopters. When will the deliveries of the systems to be procured within this context take place? Additionally, what type of payloads will these systems be equipped with? The export licenses regarding the procurement of the aforementioned helicopters have been recently approved. We will launch the project schedule as soon as possible. We will aim to accomplish the delivery of the first helicopter following the completion of the required pilot and technician training. In respect to their configuration, the crucial difference of these helicopters from the existing helicopters will be the image transfer system from air to ground which will be included according to the requirements of the user. Other than that, we can say that they possess the same capabilities of the existing “Atak” helicopters. Defence Turkey: Are there any requirements of the Naval Forces Command for the T129 “Atak” Helicopters’ Naval Forces Configuration to be utilized especially in the Landing Helicopter Dock (LHD)? What would you like to say on this subject? We are aware of the fact that our Naval Forces Command has been planning to procure T129 “Atak” helicopters. Currently there are no tangible requirements submitted to the Undersecretariat for Defense Industries at this point. We are pleased with the interest shown in the “Atak” Helicopter from different users and we would like to forthwith procure the “Atak” helicopters to meet the requirements of security forces. We will plan to conduct an array of joint activities in order to expand upon the issue in the upcoming period specific to the Turkish Naval Forces. Defence Turkey: A comprehensive test campaign was accomplished for the export of the “Atak” Helicopter to Pakistan and the helicopter received full marks from Pakistan’s procurement authorities. The purchasing country has not announced its final decision yet. Are there any change in the purchasing country’s approach to the procurement strategy regarding the sales of these platforms? Can we say that we have reached a point of sharing this good news that has resulted from close cooperation built with Pakistan, particularly in the recent period? Our efforts in respect to the sales of our T129 “Atak” Helicopters to Pakistan are on course. A far-reaching technical evaluation was managed fruitfully between the related parties and the T129 “Atak” has accomplished a harsh test campaign in Pakistan. The activities to clarify the administrative and financial terms are resuming. The Undersecretary for Defense Industries is constantly paving the way for the defense industry companies to become more competitive in markets abroad. We constantly encourage and support the local companies in overseas markets comprising incentive implementations such as using the intellectual property rights that the government acquires through the projects. Within scope of these export activities we are aspiring to share good news soon. Defence Turkey: Regarding the “Atak” Helicopter program, how are the activities proceeding for the indigenization of the turreted gun? There are some speculations that the indigenization plan has been postponed. What are your remarks on this issue as the procurement authority? As you know, the turreted gun is one of the primary components of the Attack Helicopters and we intend to manufacture this weapon system with the contribution of local resources. The postponement of the indigenization of the turreted gun is definitely out of the question. There have been certain amendments to the project model and the project is currently on its course under the responsibility of TAI. If there any changes in the progress of the project we will clarify the latest situations publicly via your magazine. Defence Turkey: The integration of the UMTAS (Long-Range Anti-Tank) missiles to the T129 “Atak” Helicopters and their qualification have recently been completed successfully. Within this context, what will the process look like regarding the initiation of mass production of these missiles and the launch of their fully operational utilization in the T129 “Atak” Helicopters? As you know, we initially accomplished the integration of the Laser - UMTAS (LUMTAS) missiles as part of this munitions group. We launched the utilization of the LUMTAS with the existing ammunitions in the inventory. Subsequently UMTAS’ integration tests have been accomplished and their utilization was authorized. Currently, there are no obstacles regarding their utilization in the “Atak” Helicopters operationally. The mass production activities of this munitions are being executed by Roketsan. Defence Turkey: The first prototype as part of the “Özgün” Multi - Role Helicopter program debuted at the IDEF 2017. According to the existing project schedule, The New Generation Multi-Role “Özgün” Helicopter is expected to make it’s maiden flight on 6 September 2018. Turkey will possess a new generation helicopter platform for the first time within this program. Within such a framework, which new generation capabilities will be attained by this program? Moreover, how will the schedule and process proceed in respect to the test, qualification, certification and production of this platform? We have made great strides in a short span of time. The program was initiated in 2013 and as of today we have proceed to the critical design stage within 4 years. The mock-up of the platform debuted at IDEF’ 17 and the official delegations and visitors showed great interest throughout the exhibition. We evaluated that this achievement is invaluable for Turkey. If we consider the entirety of the capabilities that we acquired as part of the “Özgün” Multi-Role Helicoper program it may take up hours to discuss, however I would like to underscore a few crucial points. The mobile components such as transmission and rotor that have numerous complex structures and required advanced engineering skills were designed by TAI engineers. We accomplished the Automatic Flight Control System that reflected the flight characteristic of the helicopter and elevated the skills of our pilots again as part of this project. The production and test activities of this systems are sensitively being conducted under our responsibilities. Within the scope of the program schedule, the production and test activities of some critical parts have been completed and some of them are in progress. Within the qualification and certification stage, Turkey will acquire crucial elements and the platform will possess a civil airworthiness certification. The type certification is expected to be completed in March 2020 and thereafter we will aim to acquire the military certification within the following year. Defence Turkey: The regional requirements for the Multi-Role Helicopter for the upcoming period is expected to be 250 to 300. Within this context, following the certification to be received from both civil aviation and the European aviation organization with the requirements of the civil, V.I.P and Public Institutions, do you already have any preparations for replacing especially the UH-1 helicopters as part of Turkish Armed Forces’ requirements? Do you have a plan over the potential orders that would both act as a development program and reduce the costs throughout the mass production process over various military configurations with the Armed Forces and Main Contractor? When designing the “Özgün” T625 Multi-Role Helicopter, one of our priorities was forming a basis that can fulfil both military and civil requirements. The certification we will be receiving from the European Aviation Authority will be our greatest advantage in the global market. We have already reflected the requirements to the design in order to obtain this certification. We altogether had the opportunity to scrutinize the V.I.P model cabin at IDEF. I believe that our helicopters having such features will attain a place in the market. Moreover, we have been receiving support from the Turkish Armed Forces (TAF) ever since the design stage for the manufacturing of a helicopter that would fulfil the military requirements. We have been developing a multi-role helicopter that would cover the various requirements of TAF with the help of their feedback. We are already adopting the measures that would reduce the costs without compromising safety and quality. Even though the prototype production stage is different from the mass production stage, we currently make investments by envisaging the future plan and in a way to support our subcontractors in the highest extent. As you also mentioned, the placement of the orders for mass production, from this point forward, bears importance toward the reduction of costs. Our negotiations with our potential users continue to this end. Defence Turkey: The proposal evaluation report conducted in the beginning of February 2017 within the scope of the Naval Forces Lot-III and Coast Guard Command Helicopter Procurement Project was launched in order to procure a total of 12 S-70B SeaHawk helicopters (six helicopters for Naval Forces Command and six for the Coast Guard Command) and their relevant logistics support components resulted unfavorably. Is the program postponed as a result of this evaluation process or is there a new study planned for the procurement? As a result of the negotiations that we have been conducting with the Coast Guard Command, a will to reassess the project in the medium term has emerged as the project bears no urgency at this stage. The utility helicopter requirement of the Naval Forces Command continues. We are still conducting our activities on S-70B SeaHawk helicopter’s alternatives in this respect. We try to handle this issue through a far-reaching perspective in order to enable various options for our Naval Forces Command regarding their requirements. Defence Turkey: How many helicopters have been delivered up until now as part of the Multi-Mission Helicopter launched to procure the CH-47F Chinook Helicopters from Boeing through Foreign Military Sales? When will the remaining of the helicopters be delivered? Chinook helicopters have been a long-felt need for the Turkish Land Forces Command. We fulfilled this expectancy by delivering 6 Chinook helicopters to our Land Forces Command last year. I firmly believe that you are following this development and these helicopters started to show up in the theatre and they cover a crucial gap in the range of capabilities. The remaining 5 helicopters are planned to be delivered by the end of 2018 and in the beginning of 2019. 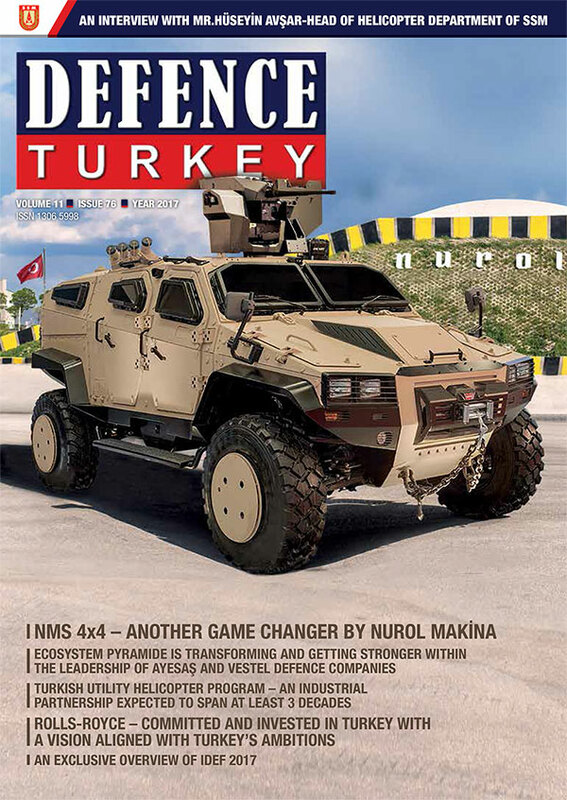 Defence Turkey: Mr. Avşar, could you please inform us on the new programs and the new tenders to be launched in this new period? As you know, in line with the mission of our Undersecretariat, we have the will to launch domestic development programs instead of launching direct procurement tenders. To this end, we are working on projects both for development opportunities regarding the helicopter requirements and the acquisition of various critical sub systems and in some cases the various maintenance capabilities of the platforms that are being utilized. Among these, various projects including a domestic helicopter project in a different tonnage may come up on the agenda in the upcoming period. There are requirements notified by various user authorities for the upcoming period. We aim to avoid implementing the off-the-shelf procurement method unless it is compulsory and to fulfil all requirements through local resources as much as possible. Defence Turkey: Lastly, is there any message you would like to convey to our readers? The recent developments that have emerged both in our country and in our region indicate the importance and indispensability of a powerful defense industry for our country’s independence and future. Within such a context, the Defense Industry projects increasingly take part on our country’s agenda. Therefore, presenting accurate information to the public regarding executed projects is of great importance. Hereby, I would like to thank you and Defence Turkey for granting us the opportunity to provide first-hand information regarding the projects we have been conducting.